Peter Doig’s new paintings reassert a consistent interest in distanced observation, whether using his naked eye or found images. 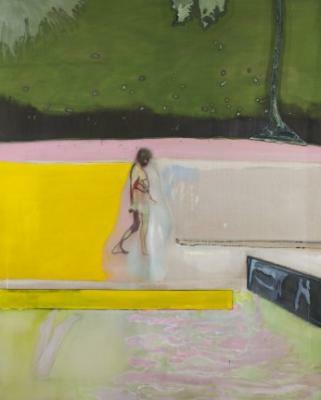 Now working like a Caribbean flaneur in Trinidad, Doig’s new series leads the viewer through tropical tableaux of beaches, swimming pools, a cricket game and sea caves. Intense, hot colours seep through and down the canvas. Hazy heat permeates scenes of entertainment and sultry relaxation. These narratives resemble both the photographic souvenir and folkloristic invention. Two paintings illustrate the scene of a solitary figure, languidly strolling in a towel on the far side of a swimming pool, head bowed in private contemplation. At one end, a pairof feet are being propelled forward into the water by a dive from a board. Hard architectural edges jut horizontally into the frame’s foreground. ‘In Walking Figure by Pool’, distant Palm trees glow candy pink at the end of the day. ‘Cricket Painting’ sets up a game by the shore, as beached waves envelop the players. We see the white ball bowled mid-air against the orange sand below plump leaves resembling fruits. A small, setting sun moving behind a mountain doubles as the eye of a bird flying across the mouth of a cave, in which a rocking boat carries a dozing man in a pink hat through the water. Doig paints island life as a condition of sleepy hedonism, employing motifs reminiscent of Gauguin’s quest in Polynesia. One painting grounds this tropical reverie by returning the viewer at the end of the exhibition to Trinidad’s place at the crossroads of historic trade, the enforced dislocation of people and regional power struggles. ‘Painting For Wall Painters’ depicts a mural located outside a bar that illustrates the West Indies’ multiple histories through the flags of post-colonial Afro-Caribbean flags. They are unnamed and require identification, including that of the United States made more elusive with the stars and stripes removed. At the edge of this multi-cultural street art is the Lion of Juddah stamped on the wall, in itself a Rastafarian act of appropriation, demonstrating the pervasive hybridity of the West Indian street. Doig’s paintings are irresistibly seductive, but for all his undeniable, aesthetic achievement, what permeates the imagination is that gap in the work between sight and comprehension, these uncanny encounters that seem to be evaporating in the humidity before our eyes.